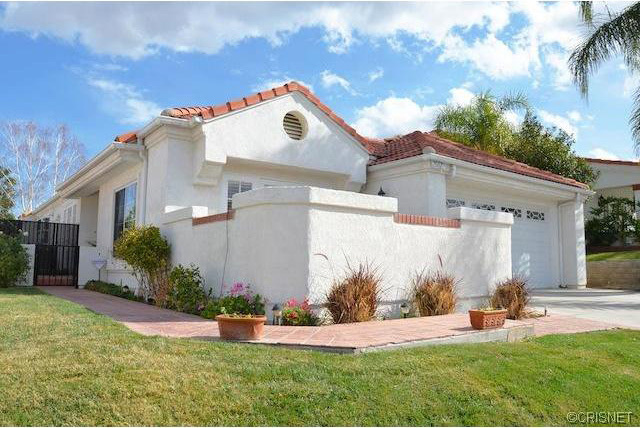 Fabulous single-story San Marino on the Valencia Summit! Upgraded & magnificently remodeled! Prepare to fall in love with the redesigned open kitchen with upgraded cabinetry, granite, a super gorgeous center island, GE Profile stove & microwave, recessed lights! The family room, with flat screen TV included, features sliding doors with custom shutters opening to large & very private backyard. A custom water feature provides spa-like serenity when relaxing outdoors. The spacious master bedroom suite features a walk-in closet plus an additional large custom closet with mirrored doors & organizers! Each bathroom has been beautifully remodeled with newer cabinets, marble & granite, & fixtures! Newer HVAC system with extra ducting; copper plumbing; newer water heater; plenty of garage storage; pretty leaded glass windows; and a lovely center atrium (with fountain) is accessible from foyer and master bedroom! Located on one of the best lots on one of the best cul-de-sacs in the desirable Valencia Summit community! Neighborhood features community pools, clubhouse, tennis, the popular arroyo trails leading to Summit Park, easy access to I-5 for commuters, and minutes away from shopping & entertainment! This home is proudly ready to welcome a new owner!